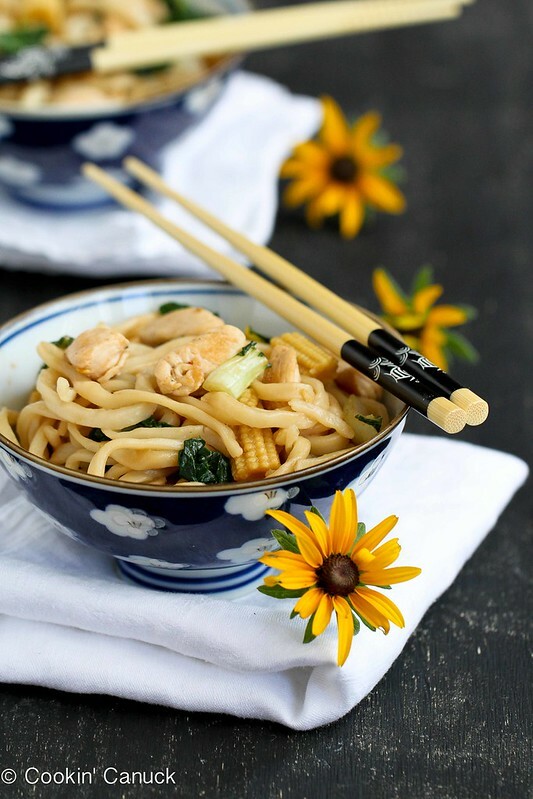 The easy dinner recipe combines fresh Chinese noodles with lean chicken, vitamin-filled bok choy, baby corn and a silky hoisin sauce. Every six weeks or so, my boys and I venture to our local Asian market to stock up on pantry items such as rice vinegar, sesame oil, hoisin sauce, and spring rolls wrappers. If you’ve never compared prices at an Asian market to your regular grocery store, you’re in for a surprise. In some instances, we pay half the price! And the garlic and ginger root? Well, they look like completely different specimens than the sad-looking variations you find in some produce sections. We can never resist piling our cart high with noodles of all types. Sweet potato noodles, rice noodles, soba noodles and fresh Chinese noodles are our favorites. The fresh Chinese noodles used in this recipe are tender and doughy, and cook in about 4 minutes. 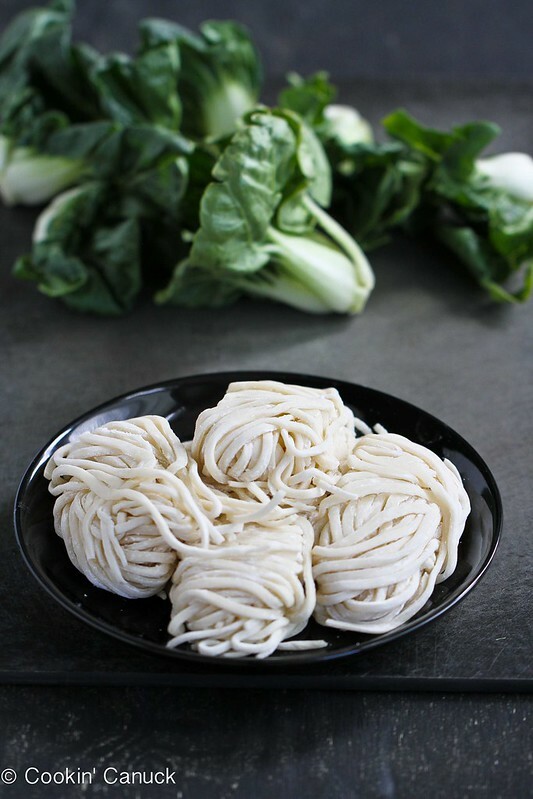 This low-fat noodle recipe has a healthy dose of vitamins from the baby bok choy, and lean protein in the form of stir-fried chicken breasts. 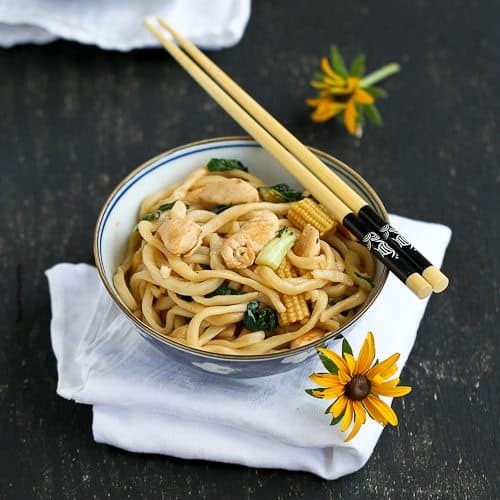 The sauce is based around hoisin sauce, with a few added ingredients to form a slightly sweet and savory silky sauce that coats the noodles and soaks into the wilted bok choy. And the baby corn? Well, those are for my kids…and the kid in me. Cook the noodles according to the package instructions. Drain and rinse with cold water. Set aside. for this dish.) Add the ginger and cook, stirring for 1 minute. Add the garlic and cook for 30 seconds. Add the chicken and cook until it is just cooked through, 3 to 4 minutes. Transfer the chicken to a bowl. Rinse the bok choy in a colander and drain, but don’t dry off the excess water. 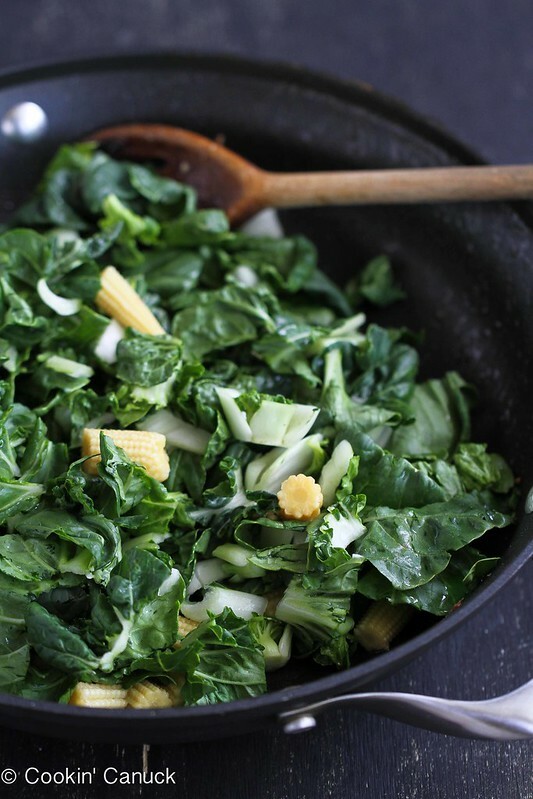 Pour the remaining teaspoon of canola oil into the pan and add the bok choy and baby corn. Cook, stirring, until the bok choy is wilted, about 1 minute. Add the cooked chicken and noodles to the skillet and pour in the sauce. Toss until the noodles are warm and coated with the sauce. Serve. In a medium bowl, whisk together the hoisin sauce, soy sauce, rice vinegar, rice wine, sesame oil and chili garlic sauce. Heat 2 teaspoon of canola oil in a large skillet set over medium-high heat. Add the ginger and cook, stirring for 1 minute. Add the garlic and cook for 30 seconds. Rinse the bok choy in a colander and drain, but don't dry off the excess water. This is pretty much my ideal meal any night of the week. Love !!!! Thanks, Liz! There’s something about Asian flavors and noodles that make any dish taste good. Thanks, Sommer! My family felt the same way. Because hoisin is very high in sugar, I often water it down (literally, with water). 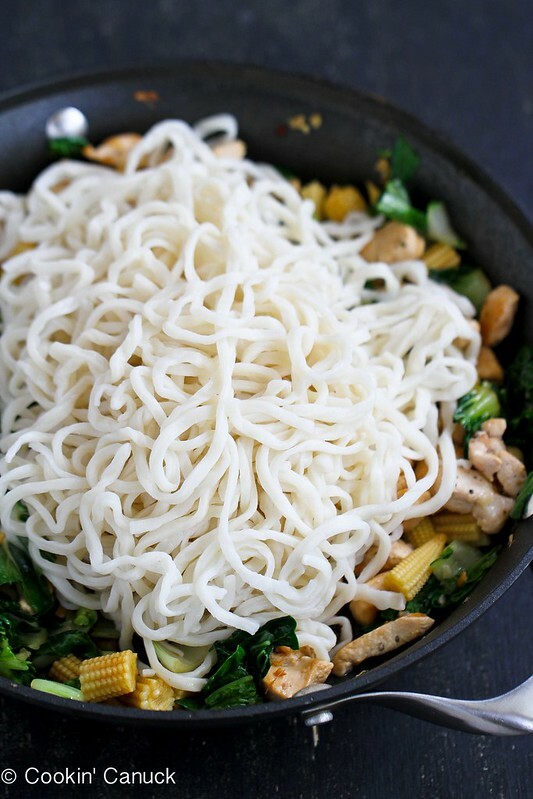 These are the kinds of noodles I could eat every night. That’s a great tip! Thanks so much for sharing that, Lydia. Asian markets are the best deal. I mean the best! Plus, they have a great selection of foods. I wish there was one closer to us in the mountains, but I have to drive to Denver so I rarely go. This looks amazing and is the perfect weeknight dinner. Quick, easy and healthy! Even though our market is only about 15 minutes away, I don’t drive there very often. So when I do, I make sure to stock up for the next couple of months! Ohhh my mouth is watering! This looks amazing! Thanks, Jamie. Believe me, my mouth was watering as I was making this. This dish combines everything I love in Chinese food! Bok choy, baby corn, hoisin sauce… yes, please! This sounds like the best dinner. Bok choy is one of my favorites ever! I love cooking with boo choy, too. The baby version cooks up really quickly and is very versatile. Oh my goodness, can I come shopping with you?! Sounds incredible. And this bowl of noodles, too. Yum!! Anytime! I bet we’d go crazy together. This has my name written all over it! I adore hoisin sauce. Can’t wait to make! Thanks, Lauren. Hoisin sauce really does make everything better, doesn’t it? This dish looks so healthy and flavorful! Thanks, Robyn! I’m always excited when really tasty dishes end up being healthy as well. Love this recipe. Thank you. Have a great day and week! Thanks, Liz. To you, too. Love this for a weeknight meal! Thanks, Laura. I have a feeling that I’ll be making this throughout the school year. Without a doubt, this is my kind of meal. I love the flavors of the sauce and the veggies you used. This is a winner, Dara! Thanks, Cassie. These are the flavors that I crave…in the middle of the day and at midnight. Such a perfect one bowl dish! What market do you go to? I used to visit one on 7th East when I lived in the Avenues but haven’t been into an Asian market in years- you reminded me how much less the prices are. I need to revisit! This looks delicious, Dara! Kelley, I go to the Ocean Mart, which is on 9000 S. in Sandy, just west of State Street. It’s on the south side of the street, right beside the liquor store and two doors away from Club 90. Call me whenever you want to go and I’ll meet you there! Asian markets are my go to ~ it’s so much less expensive than supermarkets and there are so many interesting ingredients and wonderful fresh produce. Looking forward to trying your recipe as I usually use oyster sauce vs. hoisin sauce in stir-fry noodles (except for Ja Jiang Mien). Love all types of Asian noodles, so I know my family will enjoy this! Thanks! My son plays sled hockey about ah hour away, conveniently right down the road from a Costco and an Asian market, so throughout hockey season I “kill” time shopping. I can’t wait for sled hockey season to start! 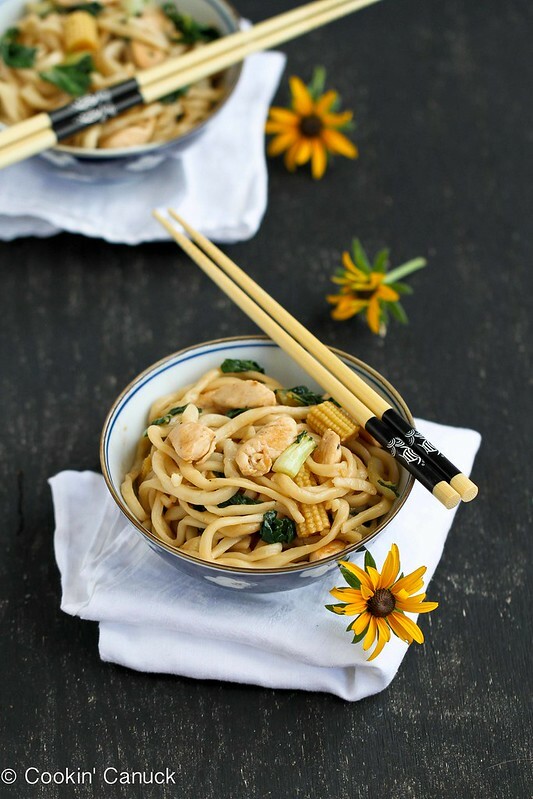 My kids love all sorts of Asian noodle dishes, and I like how I can stuff a wide variety of veggies into the meal. I really need to visit an Asian market soon! This meal looks incredible! I love chinese food 🙂 I can’t wait to try this! 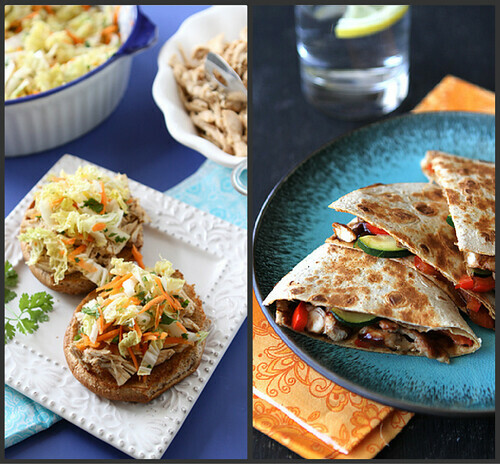 Dara, I absolutely adore your recipes! I have to be careful which ones I make because whatever I make from your blog becomes an instant favorite and afterward it’s hard for me to make anything else! This was totally a case in point. Thank you thank you THANK YOU! Can I skip the rice vinegar, rice wine, sesame oil and ginger. Don’t like those ingredients. Would use olive oil for the sesame oil.